I keep a bag of chocolate caramels at my desk. With every paragraph I write I reward myself with a piece of candy. Every deadline met. Every email answered. Every brilliant idea. Every not-so-brilliant idea. Pretty soon the bag is empty, my work is far from finished, and I have empty wrappers covering my keyboard, prohibiting any further activity. 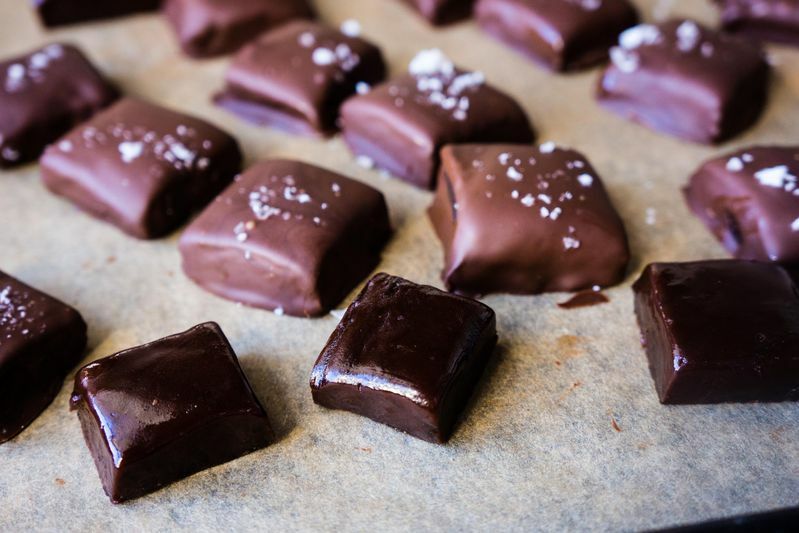 I love good old salted caramels as much as the next girl, but a chocolate caramel really makes me sing. With the addition of melted bittersweet chocolate, the classic takes on another wonderful dimension. The sometimes over-the-top sweetness of the caramel is tempered by the slight bitterness of the chocolate and rendered even more complex. 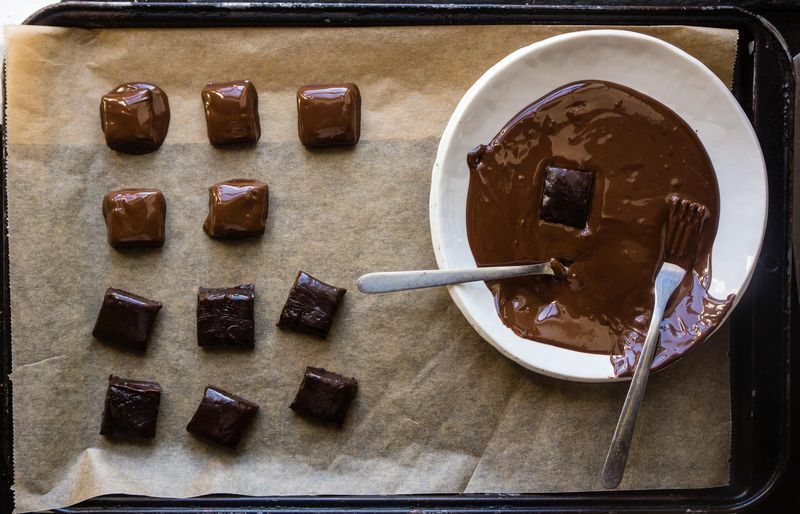 Covering the candies in more chocolate adds a delightful silkiness that awakens the taste buds and preps the mouth for all the glorious chewing ahead. 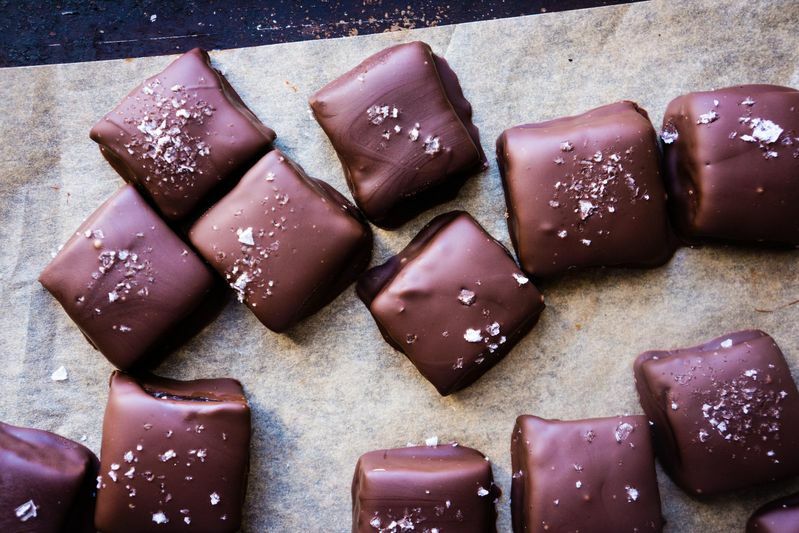 One chocolate–covered chocolate caramel is about 45 seconds of pure bliss. 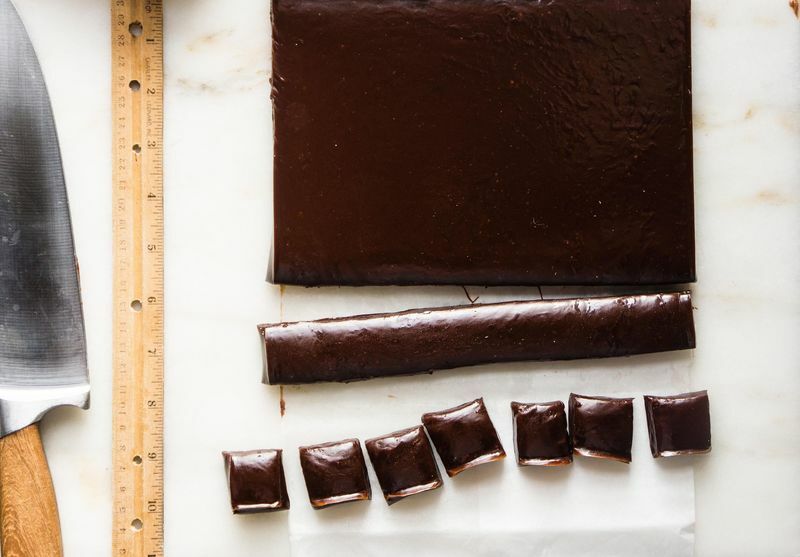 Ideally, you would temper the outer layer of chocolate to create a firm, shiny set. If you do that, you can store the candies at room temperature. Tempering chocolate is not my bag so I skip that step and simply keep them in the fridge. No matter where you store them, they won’t last long. Lightly oil an 8-inch square baking pan. Line the pan with parchment paper, leaving a 2-inch overhang on two sides. Lightly oil the parchment. In a small pot, or in a microwave-safe bowl, heat the cream and butter together until melted. Add 6 ounces of the chocolate and let it stand for 2 minutes. Whisk until smooth and set aside. 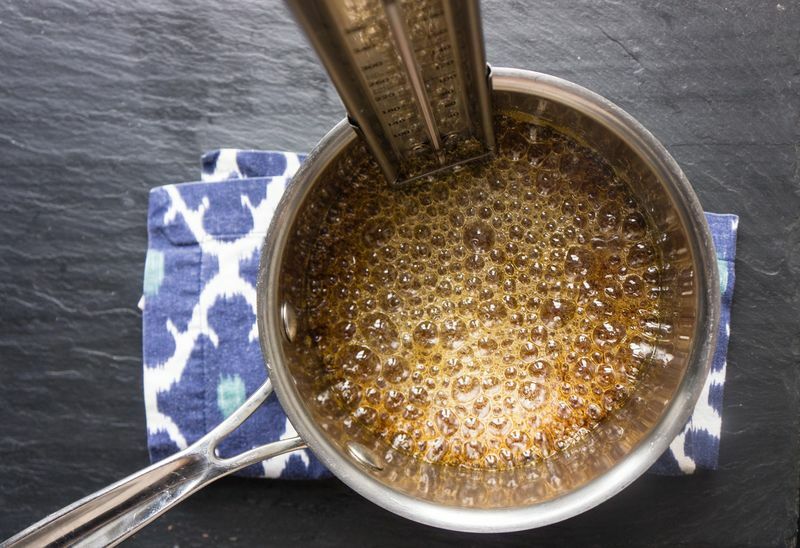 In a medium saucepan over medium-high heat, heat the sugar, corn syrup, and the water until the sugar turns deep amber, swirling the pan to caramelize the sugar evenly, 10 to 12 minutes. Remove from the heat and add the chocolate mixture. Be careful: This will bubble up and sputter. Stir until smooth, then add the salt. Attach a candy thermometer to the side of the pot and return the pan to the heat. Cook the mixture over medium heat until the candy thermometer reads between 248° F and 250° F, 8 to 10 minutes, stirring constantly. Pour into the prepared pan but do not scrape out anything that clings to the pan. Let cool at room temperature until firm, at least 2 hours. Cut around the edges to release the caramel from the pan. 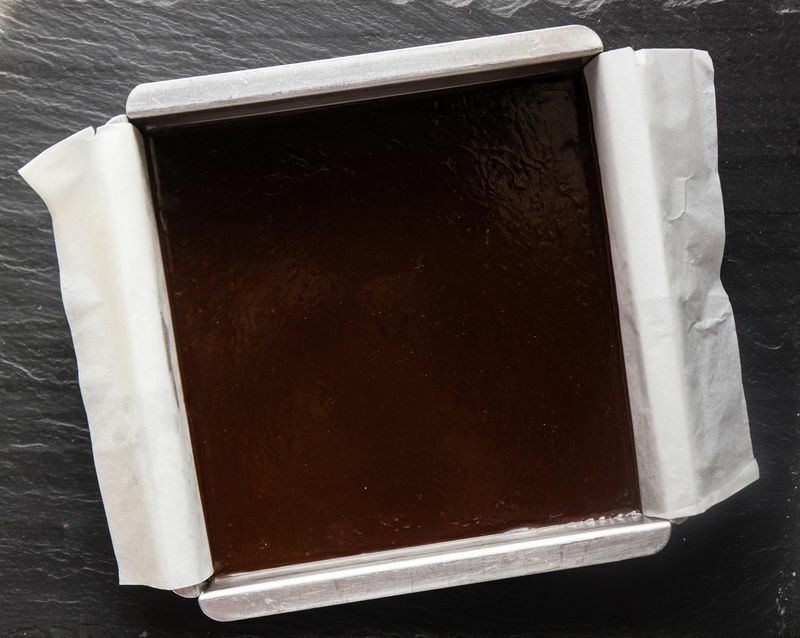 Using the parchment, lift the block of caramel out of the baking pan and set on a cutting board. Cut into 1-inch squares with a long, sharp knife. Line a baking sheet with parchment paper to prepare for dipping. 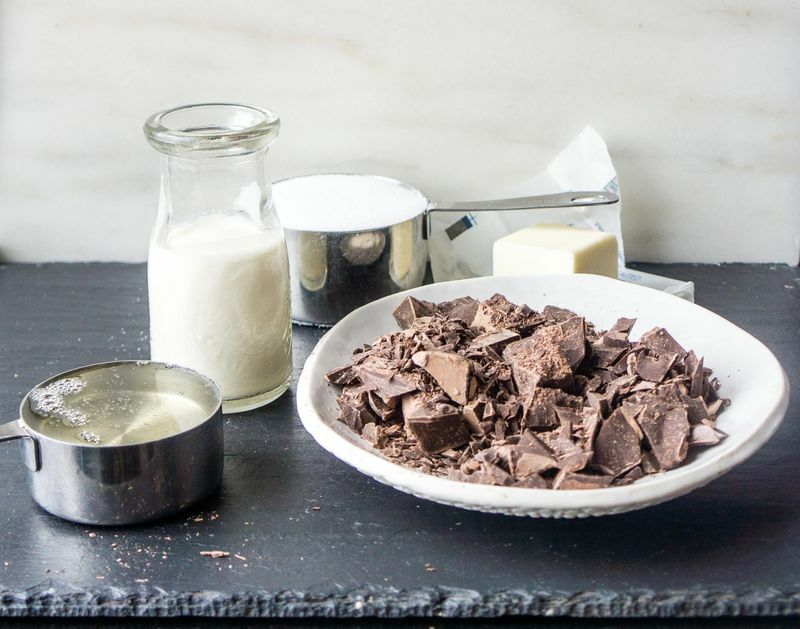 In a medium heat-proof bowl, melt the remaining 8 ounces chocolate in short bursts in the microwave or over a double boiler. 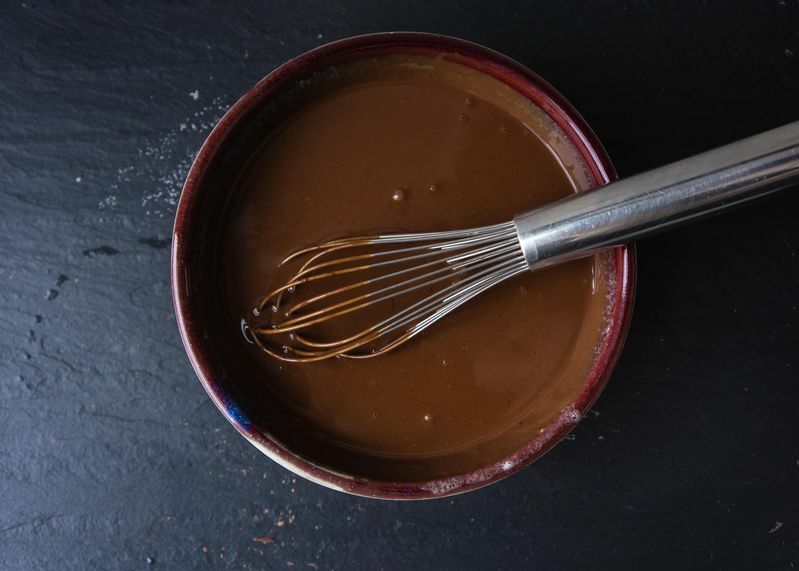 Using two forks, dip each caramel in the melted chocolate and swirl it around to coat. Tap each candy against the edge of the bowl a few times to release excess chocolate. 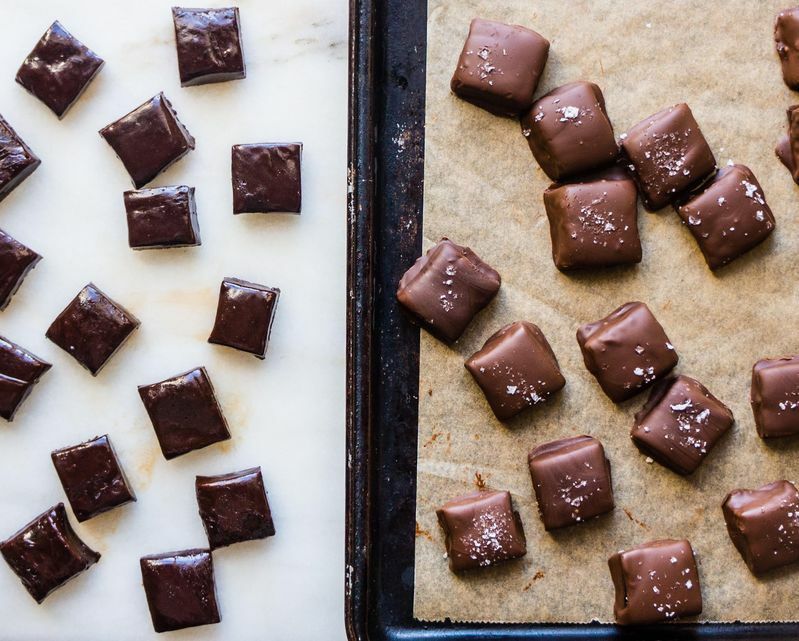 Transfer chocolate-covered caramels to the prepared pan and sprinkle with flaky sea salt. Chill for 20 minutes to set the chocolate. Store caramels in an airtight container in the fridge. These turned out really delicious for me. The only challenge was that they had to be refrigerated to keep the outer chocolate from melting, but this made the inner caramel very hard. Any suggestions on how to avoid that or keep the room-temperature stable? there's chocolate in the caramels and they're dipped in chocolate? yes, please! i also have major caramel control issues, so these would (mostly) be given away instead of on my desk in too close proximity.